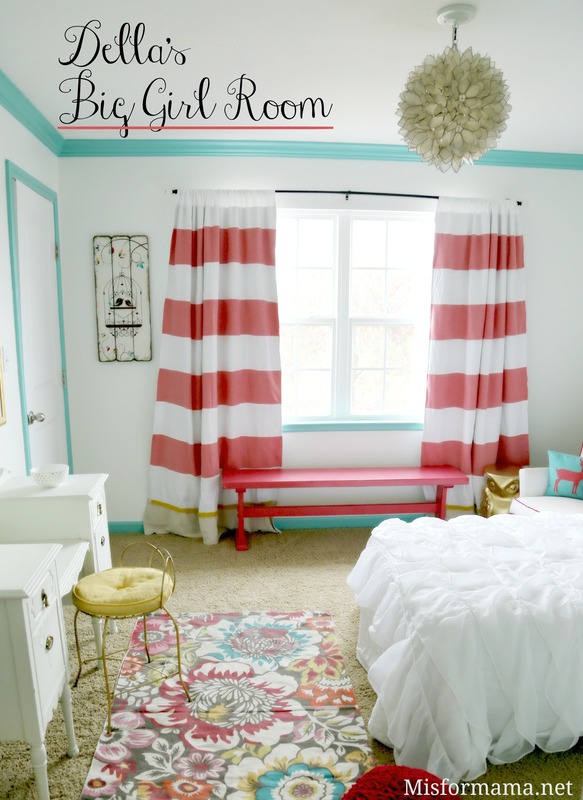 I knew it had been–ahem–a “little while” since I originally posted the inspiration board for what I planned to do with Della’s big girl room. But it wasn’t until I pulled up the actual post and checked the date that I saw that it was from April of Two Thousand TWELVE. That’s a long time to wait for a room reveal, y’all. You must really love me or something if you’ve hung on for this long. Either that, or you just gave up hope. (I don’t blame you). Now, granted, most of the important elements have been in place for a long time. But the finishing touches had languished in life-with-twins + I’ve-got-other-things-to-do land for almost three years…until about 3 weeks ago when the fact that we had a new bed (that will accommodate the twins and Della) that needed setting up forced us to rush around and get everything just so. My husband thinks it’s ridiculous that it only existed in its completely finished form for a day or two, but I had promised you a room reveal, so a room reveal you will get. Plus, although we have to do some rearranging of furniture thanks to the behemoth of a new bed, most of the elements of the room will remain the same. So, it wasn’t all in vain. Before I show you the finished room, let’s take a gander at the inspiration board to see just how faithful I stayed to my original vision. The answer? Pretty darn (faithful, that is). Wanna see? (Well, gee, Abbie, I don’t know. I mean, it’s only been three years. I think I’m good). Okey dokey. I’ll try to source everything as I go, but if there’s something I don’t, or you have questions, feel free to leave a comment, and I’ll answer them the best I can. I went with the Urban Outfitter’s rug (which was a steal at $35 but has since sold out) from the inspiration board. I love it. The colors are gorgeous, and even though the rug itself is super thin (almost more like a thick burlap than a rug), that’s not a problem since it’s layered over carpet here. I also went with the original curtain inspiration. 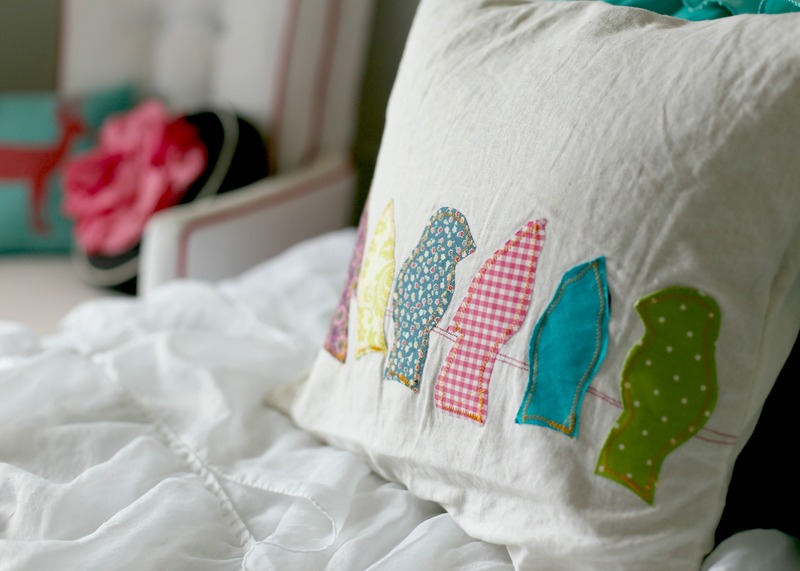 I never managed to track down the perfect curtains already done for me, so I made these from strips of $2/yard white linen and–get this–a $2 batch of fabric from Goodwill that just so happened to be perfect color. I couldn’t bring myself to cough up $150 for UO’s waterfall duvet (from the inspiration board), so I did a little DIY hack by ordering an $18 ruffled shower curtain from Amazon and simply layering it over a white $10 quilt from Goodwill. 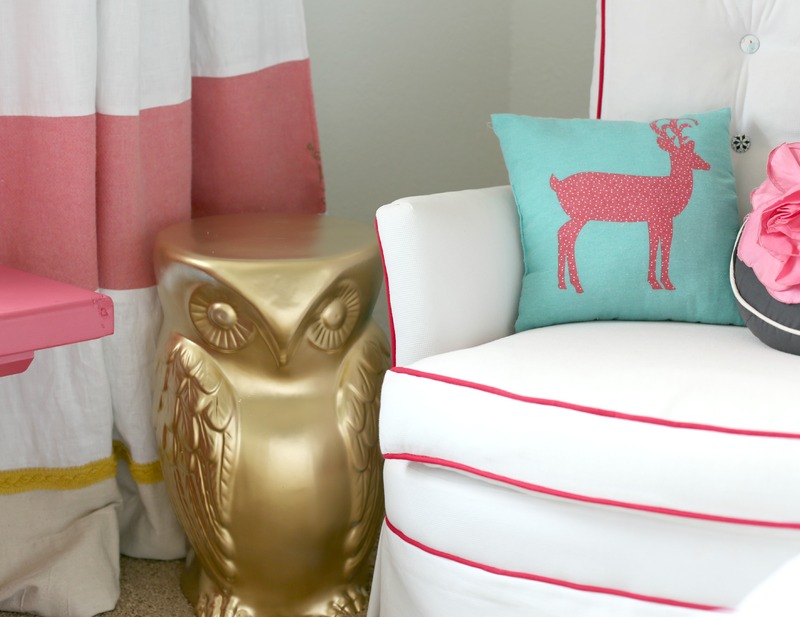 I found the pink patterned sheets at Ross, and the pillows are a hodgepodge from Marshall’s (gold polka dots), Target (teal ombre ruffle), and a pillow cover I won from a blog contest (birds). 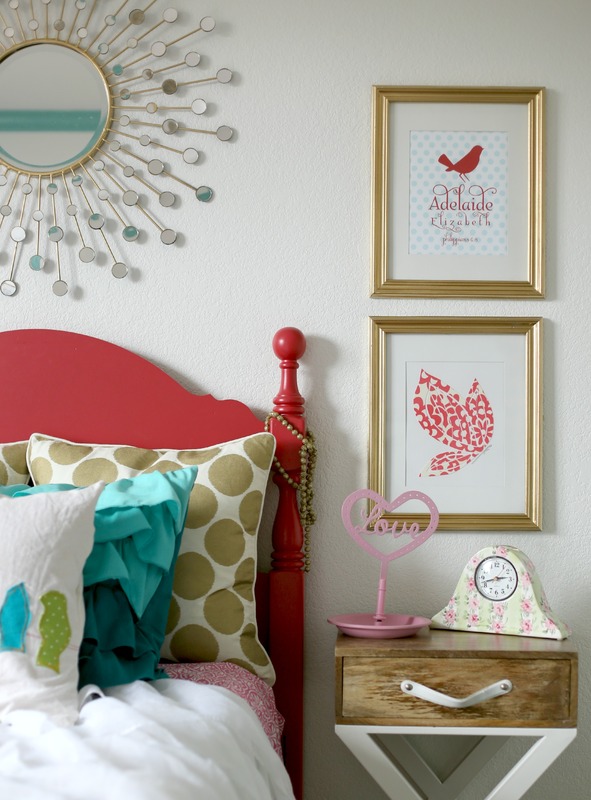 You might recognize the name + butterfly art from Della’s nursery. I big-girlified the old frames with a coat of gold spray paint, and I love how they bring a little of her nursery nostalgia into her big girl room. 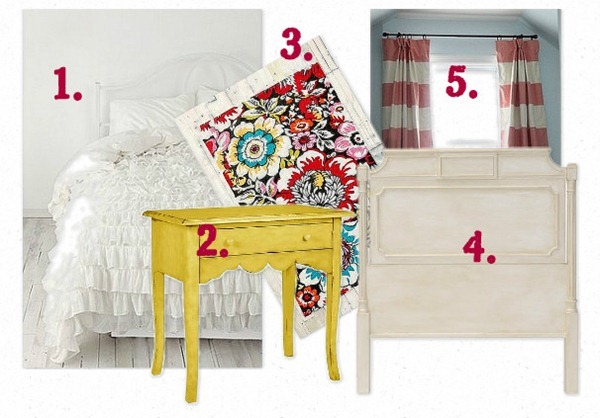 The bedside table is from Target (I revealed it in this post), the result of a ridiculously long hunt for the right style/scale of table to match her low headboard (which I found at Goodwill for $15 and which Shaun painted that lovely shade of raspberry). 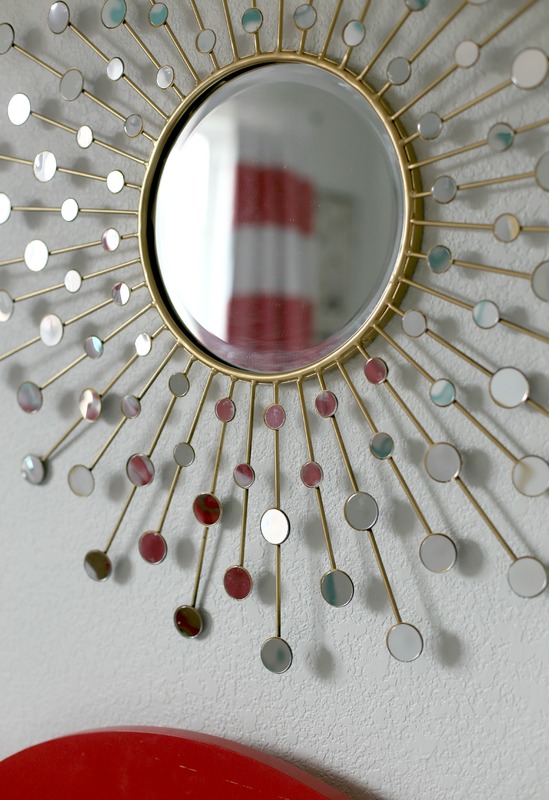 The sunburst mirror was a $20 score (originally over $100–ridiculously enough–from Hobby Lobby). The metal started out a deep rust color, so I covered the biggest mirror with paper (thank GOODNESS all of the tiny mirrors were covered with pieces of plastic, or this project would not have happened) and spray painted the whole thing gold. (Shaun and I spent way too long peeling all of the little plastic pieces off afterwards). 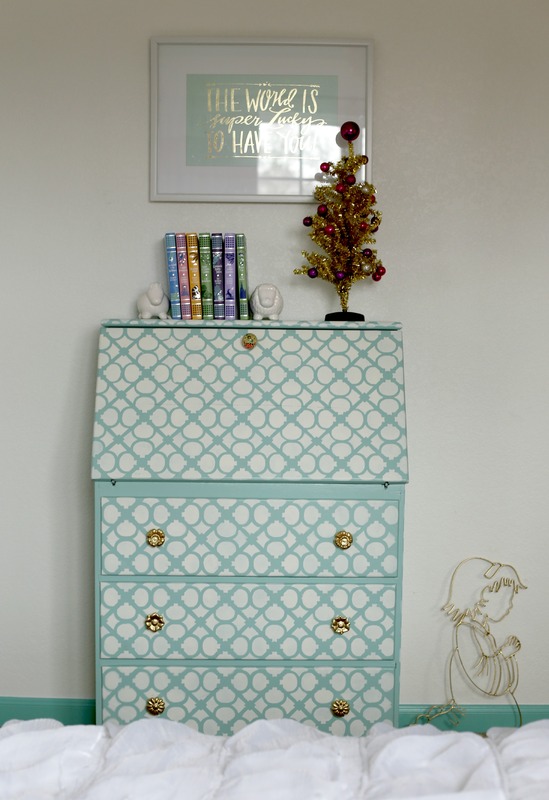 I stenciled that aqua secretary’s desk ages ago, and it still does a great job of corralling all of Della’s non-hanging clothes. 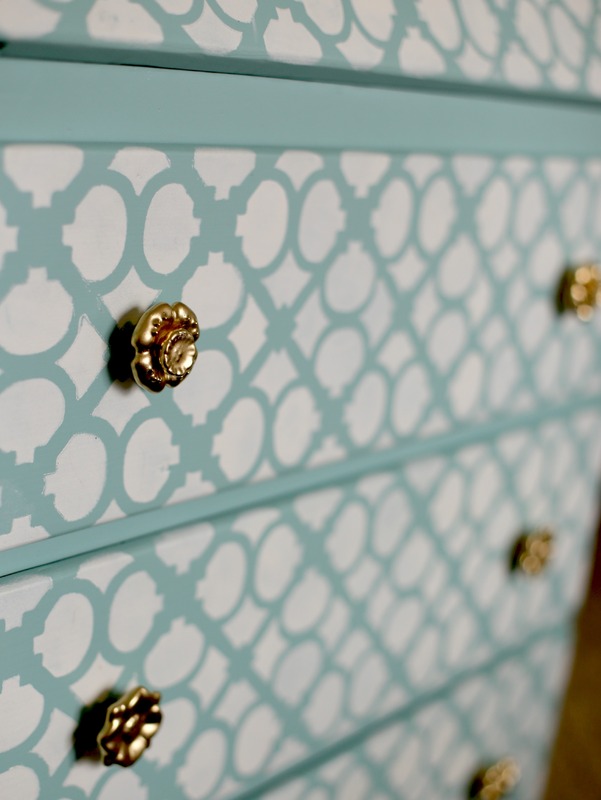 Gold spray paint makes everything better! 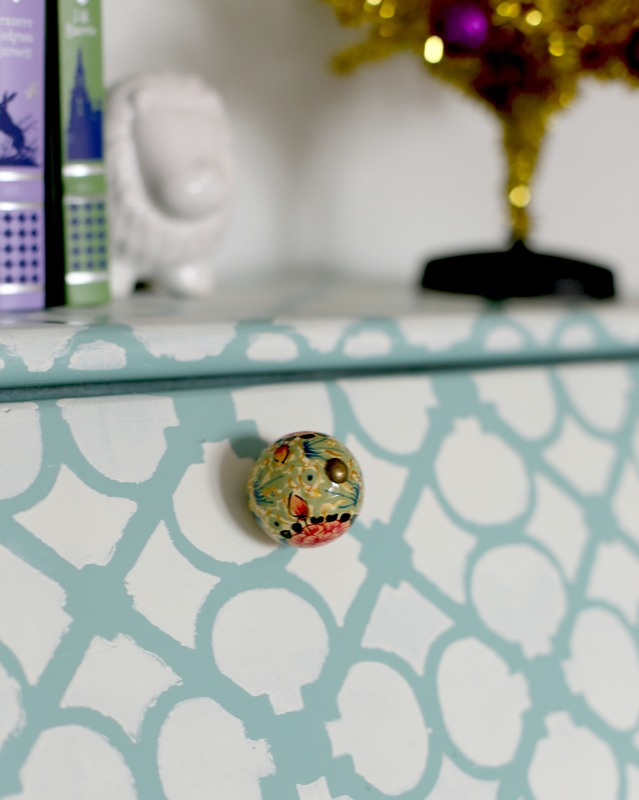 So do fun floral knobs from Marshall’s. 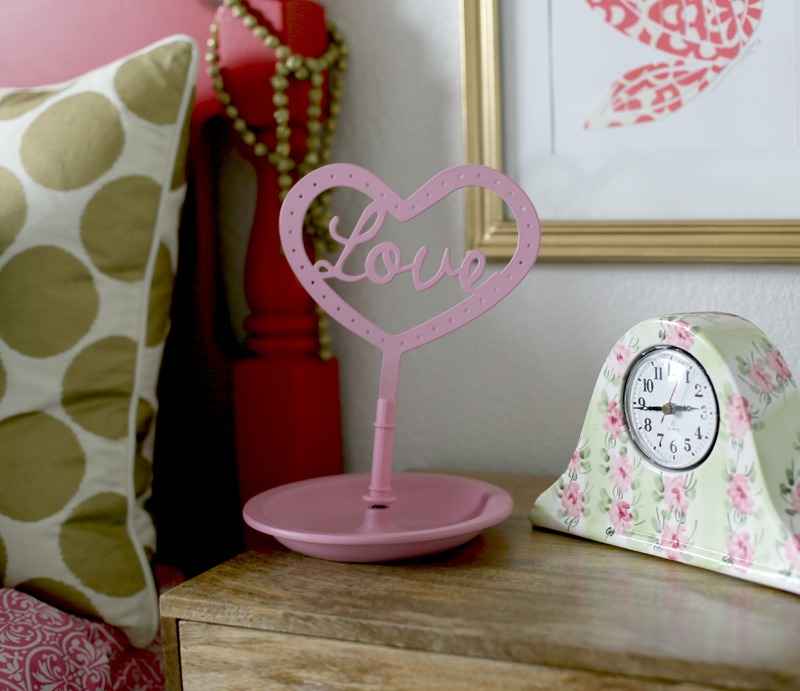 That fun framed print is from Lindsay Letters via Hobby Lobby on a 50% off sale. I love her work and was thrilled when HL started carrying some of her prints, since I’m able to get my hands on them for half off (when they run their bi-monthly art sale). 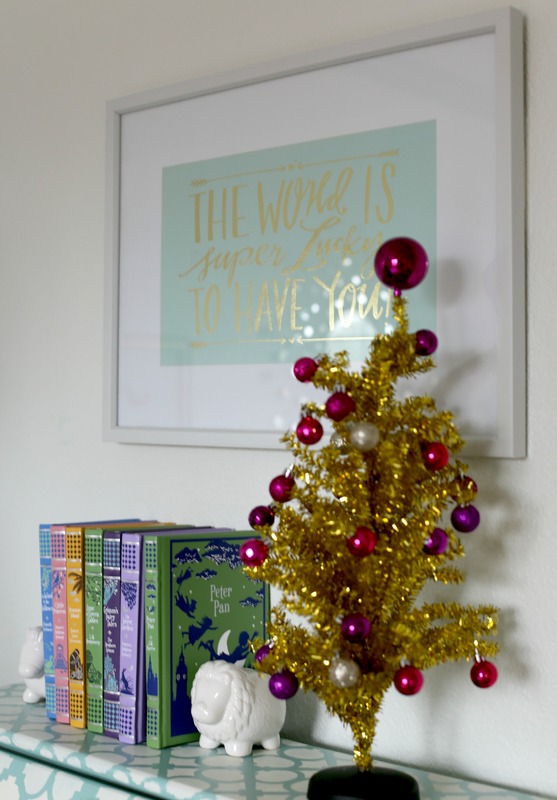 I borrowed those colorful children’s classics from our upstairs sitting room, and the gold tinsel tree is from the Target Dollar Spot last year (obviously, I took these pictures close to Christmas). 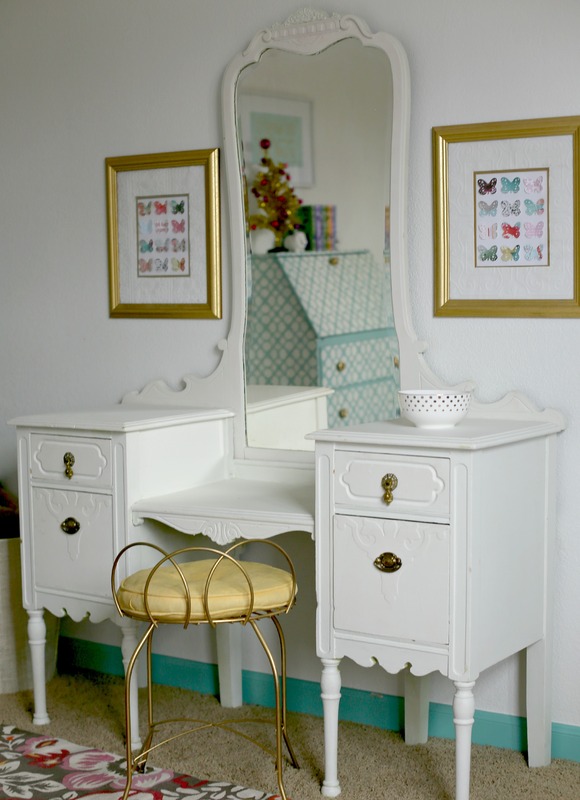 If you turn around and face the opposite wall, you’ll see this cute vanity that I scored on a local FB swap and shop. I made the butterfly art for Della’s nursery and am happy it still works well with the color scheme of this room too. Her chair is another holdover from her nursery. Sadly, I don’t have a place for it anymore now that the big bed is in, but I don’t know if I can bring myself to part with it either. I keep moving it around the room hoping it will magically find a nook I didn’t notice before (unlikely in a small, square room, no? ), but no such luck so far. The owl is from Urban Outfitter on major sale. And, yes, you guessed it: I spray painted it gold too. I’m sure you’ve got a pretty good feel for the room at this point, so I figured I’d finish up with a few of my favorite detail shots. 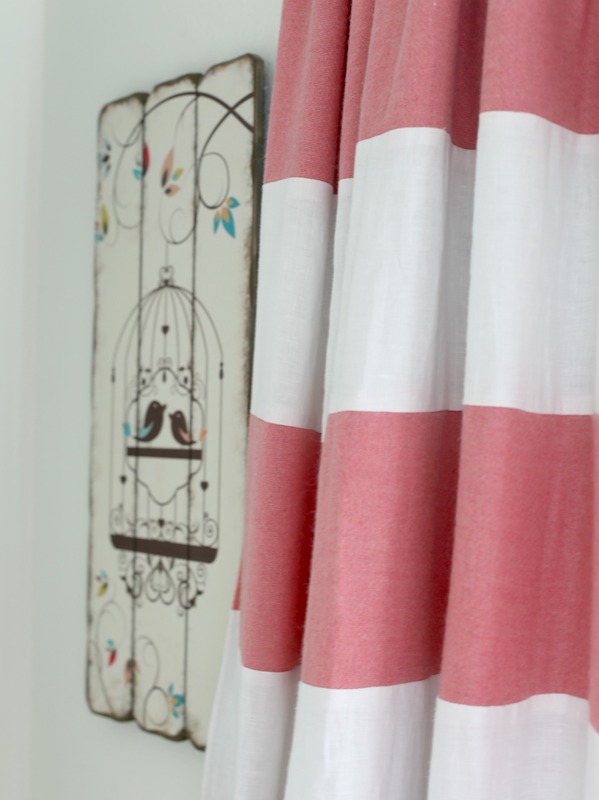 That cute wooden bird art is from Hobby Lobby on major sale, and I love the combination of its sweetness with the textured/striped curtains. 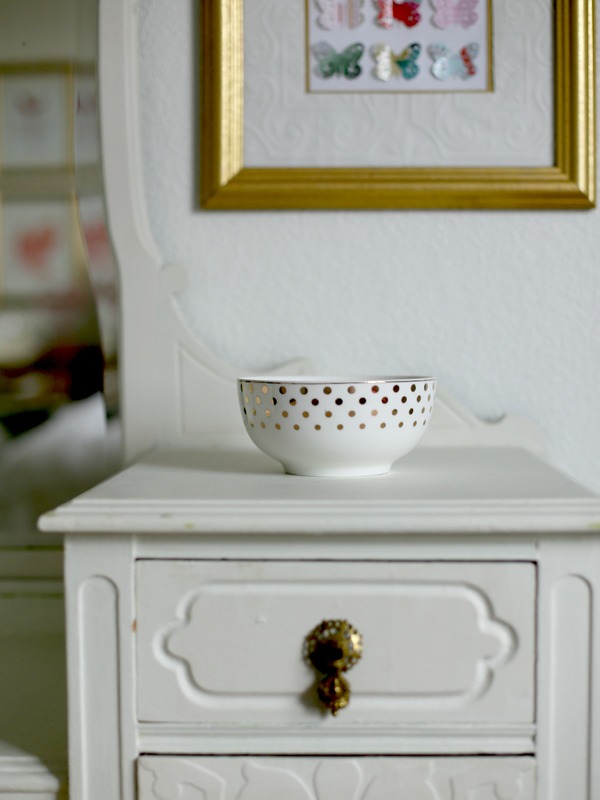 My friend, Lindsay, bought me that gorgeous polka dot gold and white bowl for Christmas, and I just about squealed when I realized just how perfect it was for this space. I think the “love” earring tree was from Ross, and the floral clock was a Goodwill score. And that, my friends, is what Della’s big girl room looked like after almost 3 years o’ tweaking and rearranging and hunting for just the right pieces at the right prices. I may be slow (like, really, really slow), but I do get there eventually. Of course, now I have to figure out the room with a giant bed swallowing it whole. So…be on the lookout for that reveal in a year or three. So, what do you think? Worth the wait? I was in warm-up stages of labor with Theo and trying not to stress and get down about my body’s weird ways right after we finished this room. To that end, I kept walking into it, taking a long look around, and saying, “I love that it’s finished. It just makes me happy!” So, yeah. It was definitely worth it to me. What about you guys? Does it take you forever to get a room just so too? Or do you like to bang it all out at once? I would love the all-at-once option if I had endless resources and cash, but, alas, I usually have to hunt for something I have in mind. It makes it all the more rewarding when I find the perfect thing, though. 1. Abbie, you are amazing. Seriously girl! I feel like I’m reading a blog from a home decor magazine. This is an awesome room. 2. Secondly, you’re amazing. I know, redundant….but…..how do you have time to do any of this?? 3. And I think this is my most pressing comment. Or rather, question. Where is all the crap? 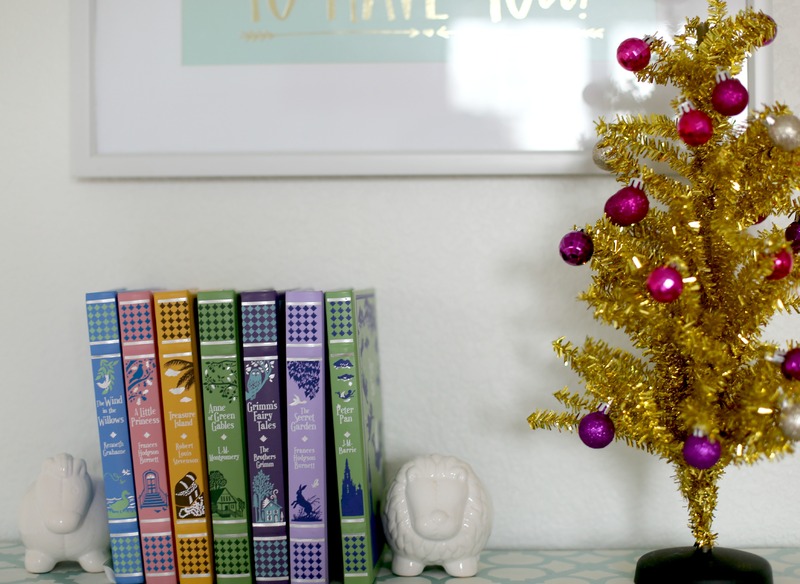 I mean…my kids’ rooms have never looked that neat & tidy. Where are the piles of papers or toys that haven’t been put away in a month? Or the water bottle? The laundry piles? That owl is TOO MUCH!!! I waaaant it. I am wondering about the light fixture as well. =) Love the room! Beautiful room! I’m super curious, the new bed for the twins & Della, are they all 3 sleeping in the same bed or is it a bunk bed of sorts? Love the room, but commenting because I just noticed that your prompt above the comment box says you’d consider making comments your sixth kid. Now that Theo is finally here that will have to change! Also, I’d also forgotten that Della was short for Adelaide. I love it. Your children have the most gorgeous names. Oh, I forgot – I had no idea that Dellas name was actually Adelaide. I almost named my 5-year-old Adelaide Elizabeth but went with Madeline Elizabeth instead. It’s such a gorgeous name, though. 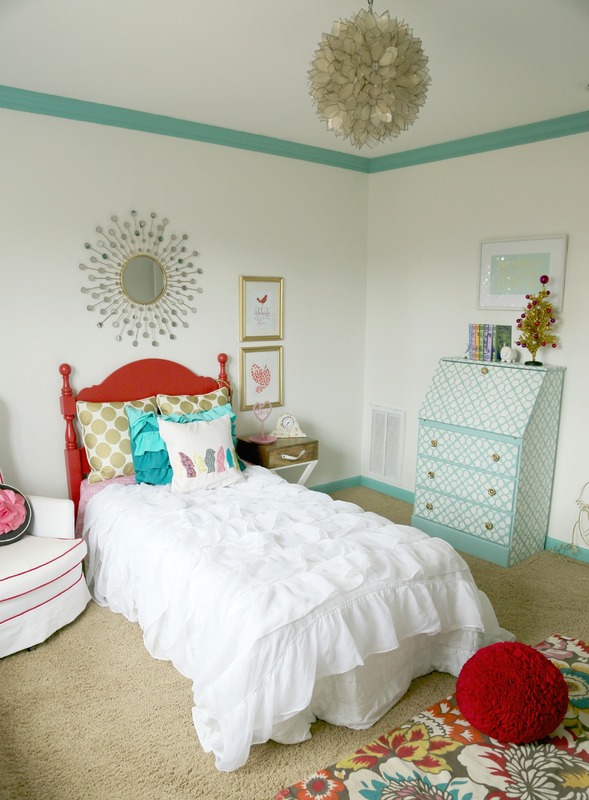 You did such a good job on her room! I have a couple of LL prints and I had NO IDEA that HL carried a few. Now I need a HL date!!! It’s sooo pretty! How on earth do you keep the white blankets white, though? I have that same shower curtain and love it, but would have never thought to use it on a bed. Clever. Not only the white blanket but white chair- how do you keep them clean?! I have a bunch of kids too…. Beautiful, Abbie! I love how this room came to life through your creative vision. 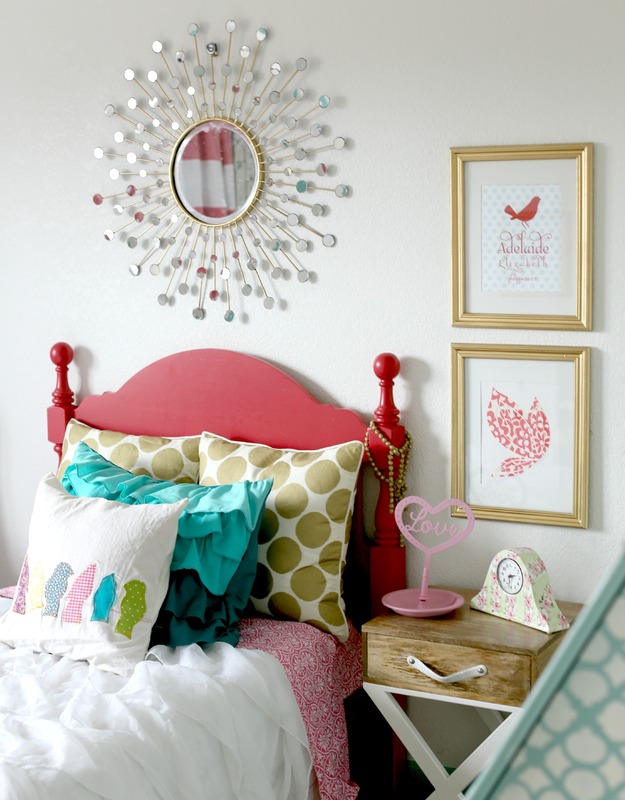 You made it into a beautiful, sweet, warm, happy, creative, peaceful, pretty space for your sweet little girl. 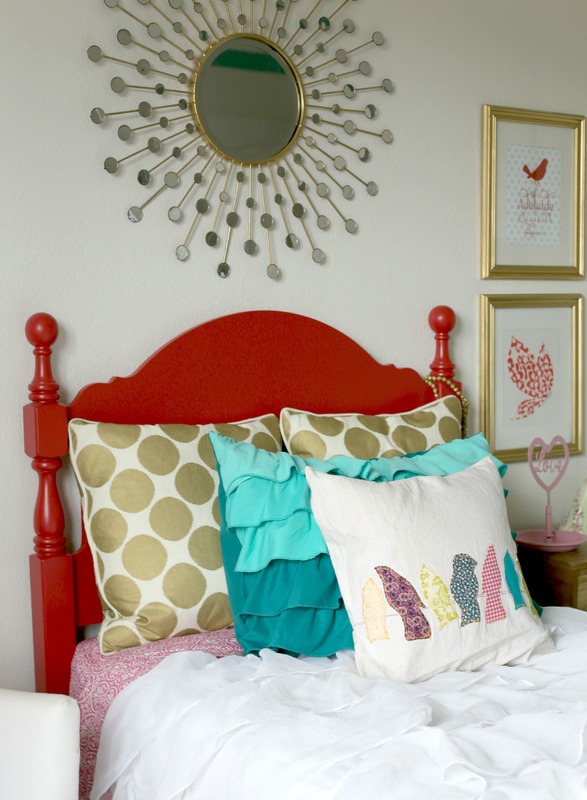 I am inspired to keep going on my daughter’s shared room that has been in progress for-ahem-a few years as well. 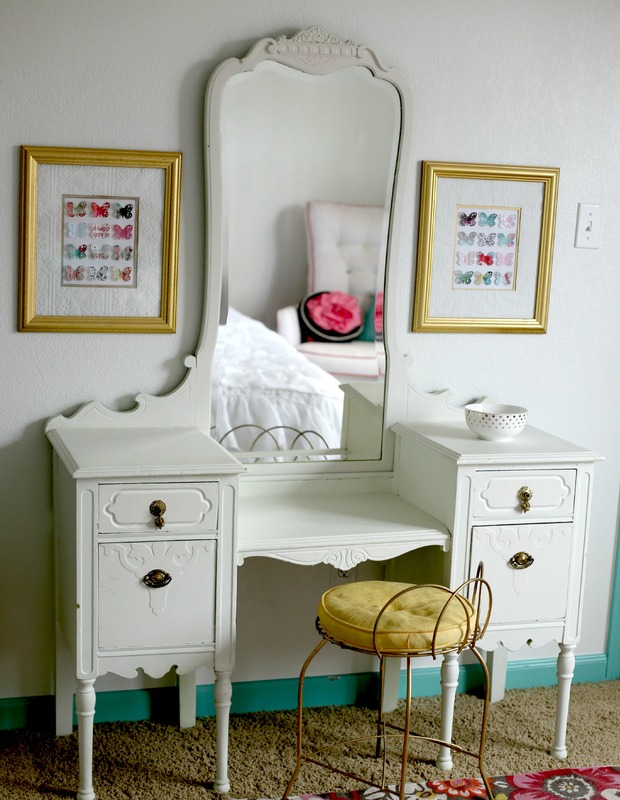 I also love to re-create thrift store and mega on sale store finds. You’ve motivated me to pick something for the room and keep working on it! I love your happy colors, gold accents, wall art, and that you used a white wall to keep the room fresh and modern. Thanks so much for taking the time to share Della’s room with us! Worth it! Yes! Awesome! 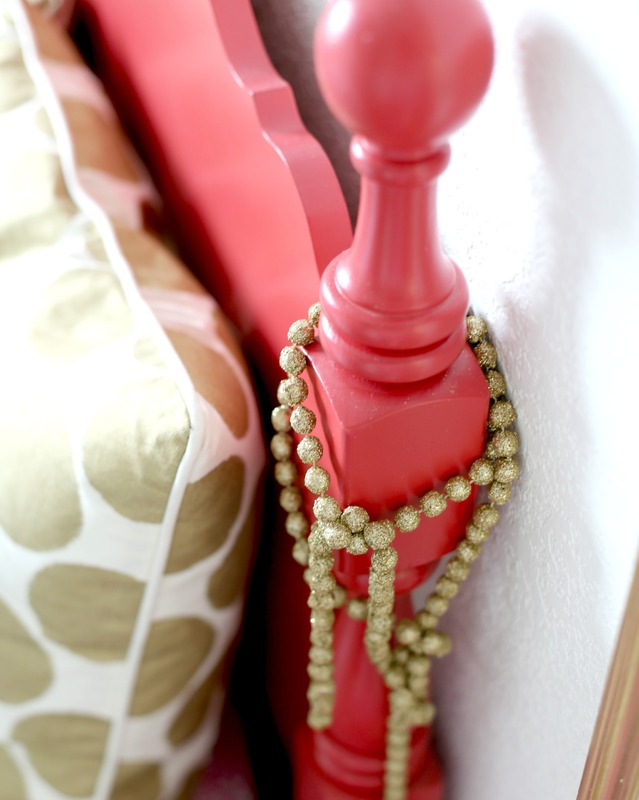 God has blessed you with some major bargain hunting & decorating talent! Thanks for sharing! the room. GORGEOUS. can you bring your precious babies and come do mine? I’ll even wait patiently until spring thaws us out. hehe. and i’ll gallantly take that pink and white chair off your hands if you bring it along. now… about this big behemoth of a bed??? I like it and have to go back and reread to get a better handle on the big bed thing. Ceilng light is nice but no comment ?Cannot find a single thing to dislike. Did you ever post on how you made the butterfly art? I’d love to learn how! Definitely worth the wait! 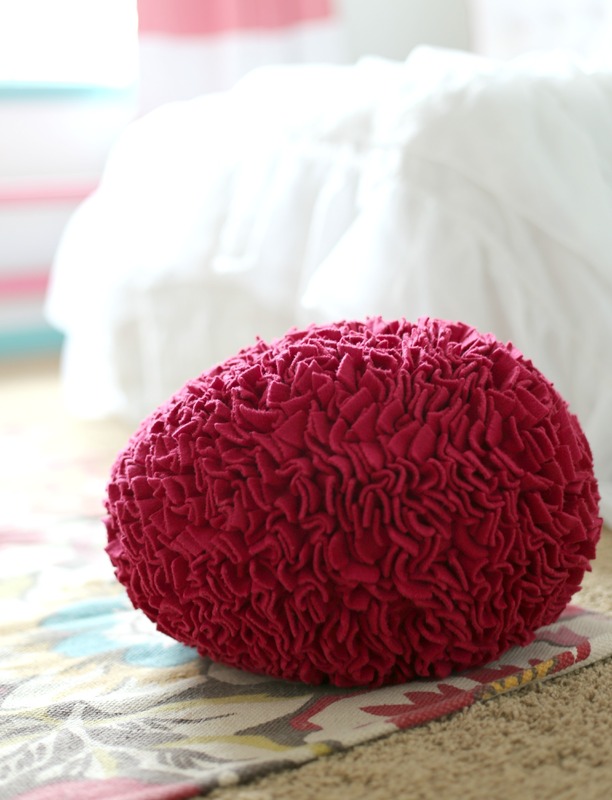 I love that pouf. Not sure I could wait 3 years for you to do a DIY one for each of the twins though – but I’m dying to know how it’s made!!! (Wanna email me some close-up photos??? With all that spare time that you have now that Theo’s arrived??? lol). Oh, and Abbie? Keep the chair. You’ll find a spot for it somewhere. Gorgeous room! Where did you get the light fixture? It’s beautiful!